Who would have thought that it was possible to use the science of everyday life to improve and almost magically enhance your relationships?! 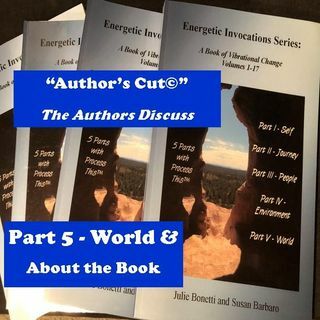 Join the authors’ discussion of Part Five, “World,” of “Energetic Invocations: A Book of Vibrational Change,” while they look at science and question your reliance on time, and explore how to live, staying balanced while unveiling your truth. Absorb the authors’ discussion, and buy the book to use as a tool and process to reveal new information, ... See More perception, and understanding, as you do the work, invest in yourself, and fill your journey with self-empowerment!